You've probably been to something created by MadPea Productions — perhaps their incredible and immersive build Carneval, which was one of the main attractions on the grid last year, or one of their many remarkable hunts. And maybe you've been seeing hints and teasers about UNIA, the next great build coming up, which Kiana Writer (founder and director of MadPea) and her team have been slaving over for about a year now. (Images here are some early shots of the build, and Kiana's in the lowest photo along with a lovely gargoyle. The third image features an area created by Bryn Oh.) 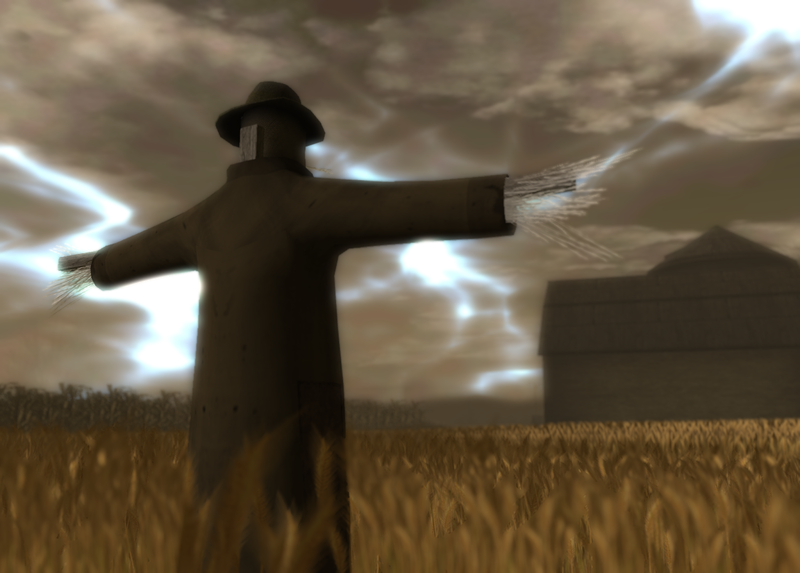 UNIA won't be just a place to visit — it's full-fledged game within Second Life that has demanded an incredible amount of scripting and other resources. A good way to get a peek at some of UNIA's behind-the-scenes work is on the Drax Files Episode 8, which includes an interview with Kiana. Beyond the intense human effort that goes into creating something like UNIA, there's another major factor: cost. To develop the game, MadPea has had to pay tier on two full sims without much outside income — that's $731.60 per month in U.S. dollars, including a 24% tax Kiana has to pay as a resident of Finland. "The costs of this platform are very high and I have been struggling with this for a while in my mind," says Kiana. "Should I do a fundraiser for UNIA or not? ... To fund the development of UNIA we have had to join all kinds of events and arrange hunts and gacha fairs etc to make sure that we can keep up with the payments of the islands." But these hunts and other activities have actually slowed down the pace of UNIA's development, so there's a Catch-22 to the strategy. Kiana continues, "An incredible amount of manhours, love, sweat and tears have already been put into making UNIA, and finally we are getting closer. We will need still around 2-3 months to release it. We are losing the Da Vinci Isle (Mad City) in the end of May and have no place to carry on keeping events to raise funds in order to keep UNIA islands paid." While direct inworld contributions are of course welcome, MadPea has established a GoFundMe site — http://www.gofundme.com/Release-Unia — where you can provide cash support. You can give any amount, but for $50 you'll receive an exclusive UNIA outfit for your avatar, and for $500 you'll get an exclusive UNIA tour by Kiana (I've had one, and it's not to pass up! ), early access to the game, a free HUD, weapons and outfits. The goal is $4,389, and that means that only 88 people each giving $50 will put the drive over the top. (And you spend that much just going to the movies, right, between tickets, munchies, parking and whatever else?) So lend a hand if you can, and you can look forward to something extraordinary coming your way this summer. I like this makeshift Kickstarter request for funding. She sure is an amazing talent! Best of luck! The whole team is amazing, and I would name them but I'm afraid I'd leave someone out!